We grew two kinds of winter kale, Blue Armor and Red Russian. Blue Armor is a lovely, frilly green, but has a tendency to collect mold along the underside of the stem, so I have to trim it carefully. Red Russian isn’t as attractive, except for it’s purple hue, but it tastes just as good. I pick a grocery bag full at a time. When I get it home, I wash the leaves in a sinkful of water, strip out the stems and affected parts, drain them and store in the fridge in a plastic bag. When it’s time to make a salad, the hard work is already done. Here’s the simple recipe for a typical winter salad at our house. Into a bowl with a top that seals goes a scant tablespoon each of balsamic vinegar and olive oil, plus just a hint of stevia for sweetness. Swirl. 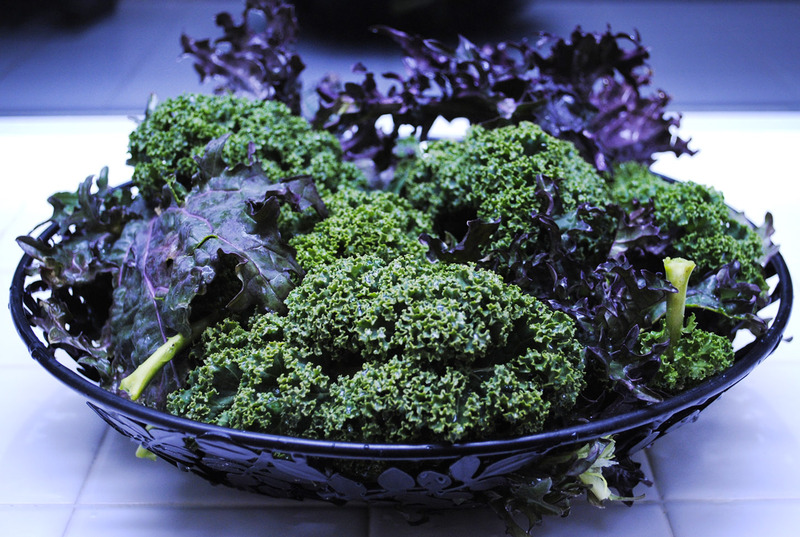 Spin dry the kale, cut it up and add it to the bowl. Put the lid on and shake until the salad is coated. Simple. Delicious. Health note: In 2016, Jim was diagnosed with thyroid issues. In our research, we discovered that he needs to avoid eating raw cruciferous vegetables. Kale salad is now a lovely memory, but there are plenty of ways to eat it cooked and enjoy it’s health-giving, cancer-fighting benefits.